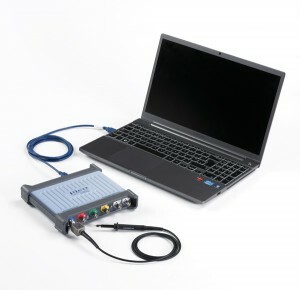 Embedded Products/Services: Pico Technology’s PicoScope 5000 series uses reconfigurable ADC technology to offer a choice of resolutions from 8 to 16 bits. For more information, visit www.picotech.com/picoscope5000.html. Product information: The new PicoScope 5000 series oscilloscopes have a significantly different architecture. High-resolution ADCs can be applied to the input channels in different series and parallel combinations to boost the sampling rate or the resolution. In Series mode, the ADCs are interleaved to provide 1 GB/s at 8 bits. In Parallel mode, multiple ADCs are sampled in phase on each channel to increase the resolution and dynamic performance (up to 16 bits). In addition to their flexible resolution, the oscilloscopes have ultra-deep memory buffers of up to 512 MB to enable long captures at high sampling rates. They also feature standard, advanced software, including serial decoding, mask limit testing, and segmented memory. The PicoScope 5000 series oscilloscopes are currently available at www.picotech.com. The two-channel, 60-MHz model with built-function generator costs $1,153. The four-channel, 200-MHz model with built-in arbitrary waveform generator (AWG) costs $2,803. The pricing includes a set of matched probes, all necessary software, and a five-year warranty.